The Gannon University women’s basketball team capped a successful week with an 81-71 upset victory over host Seton Hall Saturday. The victory, coupled with the Knights’ 65-60 win over Pitt-Johnstown earlier in the week, left Gannon at 7-16 overall and 7-10 in the Pennsylvania State Athletic Conference play going into Wednesday’s 5:30 p.m. road matchup at California University of Pennsylvania. The Knights have now won three of their last four starts after losing four straight and eight out of their previous nine. Maggie Mitchell was on fire for the first half of Saturday’s 10-point win over Seton Hall. Mitchell scored 22 points and dished out three assists in the first half alone and captured PSAC Player of the Week honors for her 33-point, four-assist effort. Mitchell connected on 11-of-16 shots from the floor, including 7-of-9 from three-point range for Gannon, which built a 45-27 halftime lead. Lanise Saunders netted 10 of her 16 points in the first half while Chelsea Rourke contributed 10 of her 15 during that stretch. Saunders registered another double-double as she pulled down 13 rebounds to go with her 16 points. Seton Hill was able to pull within six points in the final quarter at 63-57, but that was as close as the Griffins would get against Gannon, which shot 54 percent from the floor for the game and 48 percent from long-distance. The Knights also outrebounded the host team 36-20. Gannon also shot well in the win over Pitt-Johnstown, hitting on 48 percent from the floor overall and 40 percent from three-point range. Mitchell again led the way with 16 points, with 10 of those coming in the pivotal fourth quarter, and contributed seven assists. Rourke, named ECAC Rookie of the Week for the second straight week, finished with 14 points and four assists. 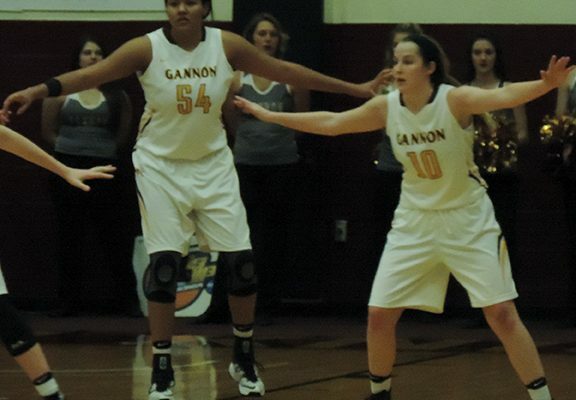 Saunders added 11 points to go with six rebounds, and Lauren Tewes had a game-high eight rebounds for Gannon. The Knights led by three at halftime but trailed by one late in the third quarter before pulling back in front and leading 46-43 going into the final quarter. The Knights went on a 13-4 run that resulted in a 12-point lead at 59-47 with just under 2 minutes to play and that secured the win. Following Wednesday’s game at CalU, Gannon will travel to take on Clarion at 5:30 p.m. Saturday before returning home to host Edinboro at 5:30 p.m. on Wednesday, Feb. 15, at the Hammermill Center.